Cruise around the island of Ponza, and spend a day out on the waters of the Tyrrhenian Sea. After a shuttle boat service to the island from Terracina, you’ll swap onto a motorboat, equipped with shade and sunbathing areas. Look out for the series of Roman caves and pools that is Grotta di Pilato, as well as a historic lighthouse perched on the headland. Finish with free time at Frontone Beach before a shuttle back to Terracina Port. Lunch, wine, water, and coffee are included during the day cruise. Make your way to the Ponzaturismo office at the departure area at Terracina Port. Step aboard your boat for the hour-long cruise to the island of Ponza. After a stroll around the port area, board another boat and cruise to the southern end of the island where the Grotta di Pilato awaits. Dating to the Roman period, the caves are a complex of tunnels and pools set into the cliffside. Continue cruising past the rocky and rugged cliffs, and look out for remote bays and the eye-catching Promontory of the Old Lighthouse as you go. Enjoy a pasta lunch on board, along with wine, water, and coffee. When the boat returns to shore, you’ll have some free time at Frontone Beach to bask in the sun. 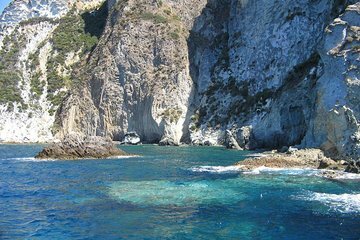 Return to Ponza Port by one of the frequent shuttle boats at a time that suits you. Your ticket is included, and the journey takes roughly 10 minutes. Just be sure to arrive at the port in time for the evening cruise back to Terracina Port.